Joanna Hope Jewel Neck Overlay Top is rated 4.0 out of 5 by 2. Exclusive to us - Joanna Hope. 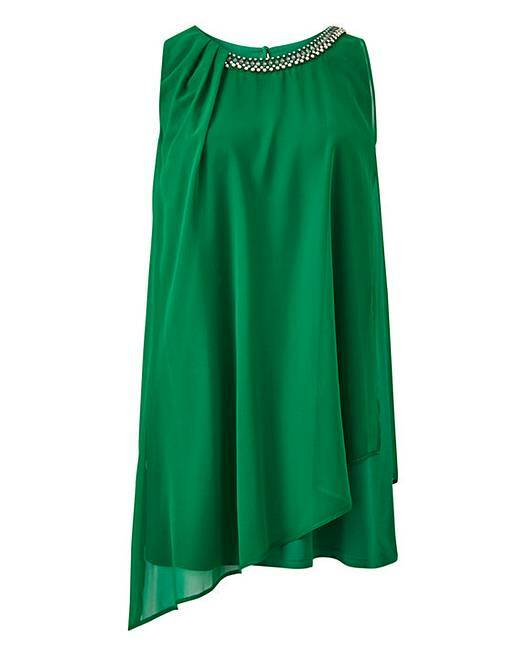 This stunning emerald green stretch jersey top features elegant chiffon over layer and is asymmetric in style. The neckline is trimmed with jewel detail. Looks great worn with jeans or with trousers for more formal occasions. A great piece for holidays, cruisewear or any special occasion. Rated 3 out of 5 by Eyes45 from Nice. Deep green colour Nice top, lovely deep colour. Material underneath feels a bit cheap for the price paid and top arrived very crushed. Rated 5 out of 5 by modern family from Perfect I bought this top in blue a couple of years ago and was delighted it reappeared in another colour. The green is equally stunning (sorry for those of you who didn't get the blue). This top is so comfortable, it is perfect for holidays, going out to dinner, xmas party. The detail around the neck means you don't have to worry about wearing a necklace and the jewels on my blue one are still in place even after washing and wearing numerous times. Please can we have this in black as soon as possible, I don't want to wait another 2 years for another colour. This is my favourite top when I go to Vegas and this would be stunning in black.